Despite the ongoing violence in Thailand’s deep south it is still possible to find plenty of peaceful spots to relax. Whether you are a spiritual tourist looking for an escape from city or one of many that find themselves stopping over in transit, why not get out and see more than the four walls of your hostel room? None of these temples are listed in the guidebooks so feel free to leave it at home. Wat Plukkhla sits off the beaten track (and literally down a dirt track) in the area just off the airport in Hat Yai. 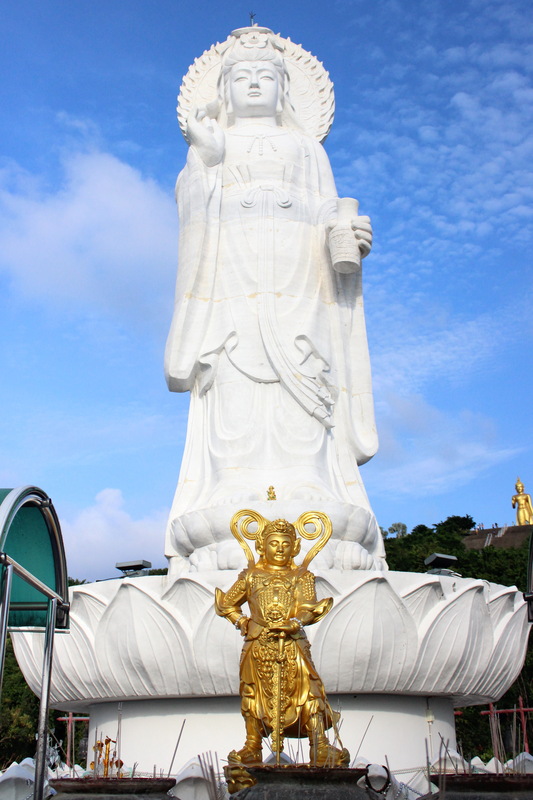 A walkway lined with dozens of Buddha images leads to a giant seated silver Buddha. Climb the stone steps and make your way around the statue, ringing each of the memorial bells that hang around the edge. The monks’ residences are around the back so look out for bright orange robes hanging out to dry. This temple has a few friendly dogs but nothing to worry about. You will need your own transport [i] as no public services come out this far. How to get there: Head towards the airport and take the left for the airbase. The temple is around 15 minutes down the road that gradually changes from tarmac to bumpy dirt track. A really nice drive through the real Hat Yai. 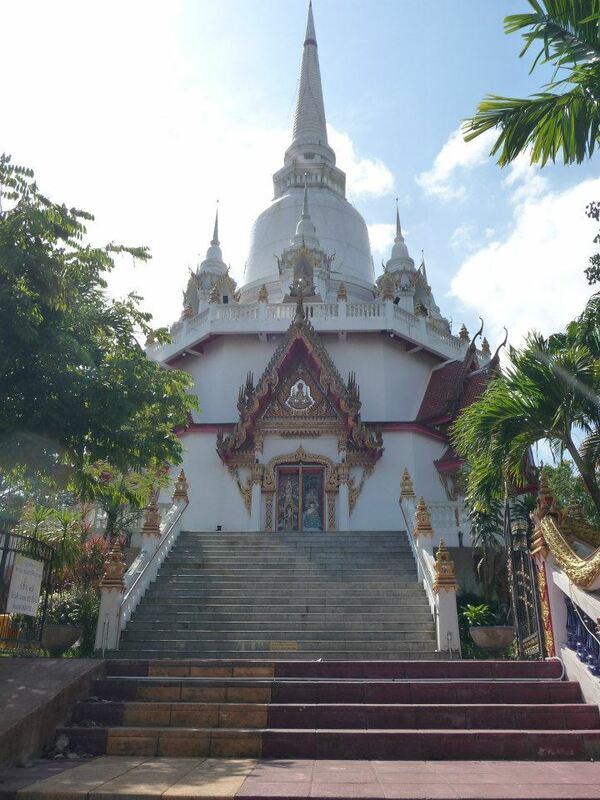 This mini temple complex is right next door to the large Tesco Lotus store opposite Prince of Songkhla university. Traditional Buddhist temple music plays out through loudspeakers as you walk around the numerous shrines that lay in the ground of this temple that also doubles as an educational center for monks in training. Walk amongst the golden monk statues, each one standing over eight feet high and commemorating the life of a monk. Buy some fish food for 10THB (leave your coin in the honesty box) and feed the koi carp and catfish to make merit. There is a nine-story pagoda that offers views across the city and down on the temple complex for those brave enough to climb its steep marble steps. How to get there: Its central location means that it is reachable by public transport – many of the public songhtaews [ii] (open backed trucks) stop nearby. This temple is all steel and made up of hundreds of steel circles sitting on top of more circular golden rooms interconnected with – you guessed it – circular passageways. Each round room houses a different Buddha statue and is free for use as a meditation or contemplation spot. The view out of each circular window changes as you make your way around this really unique building. Climb the steps and emerge within the chedi itself, surrounded by the twinkling of a thousand bells. It’s really magical and there’s no other temple like it in Thailand. How to get there: Unfortunately no public transport comes this way so your own transport is needed. You can find the temple down the road that goes beside Prince of Songkhla university, perched on the side of the hilltop. This unexpected urban temple sits in the Hat Yai Nai district close to the city center (just over the bridge near immigration) and houses a very big secret; a 35m secret to be exact. 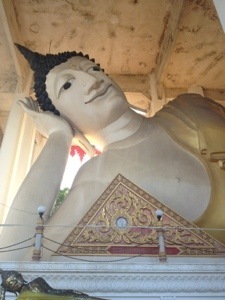 This reclining Buddha statue is the third largest in the world and yet you won’t see any tourists here. It’s a little bit worse for wear, but then again most things off the beaten track are. How to get there: Take a white or blue songthaew from the city center. The temple is just over the bridge on the other side of the road. 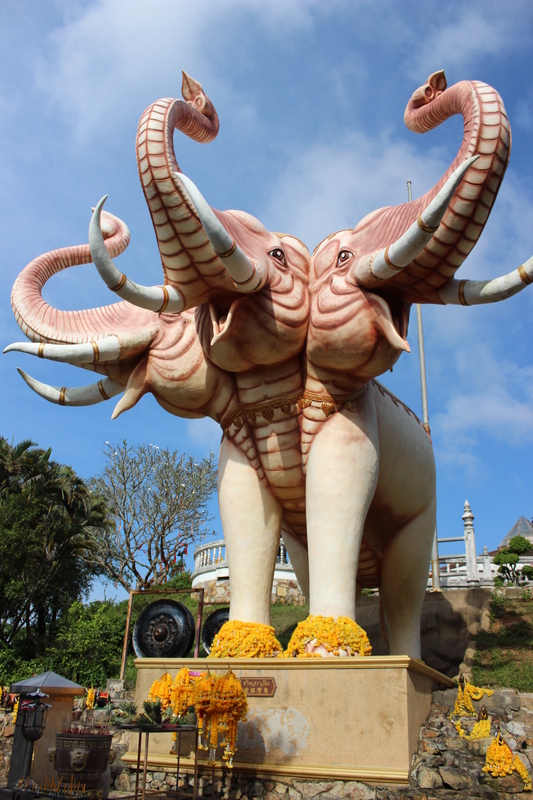 This spectacle is one of three temples situated on Korhong mountain in Hat Yai Municipal Park. 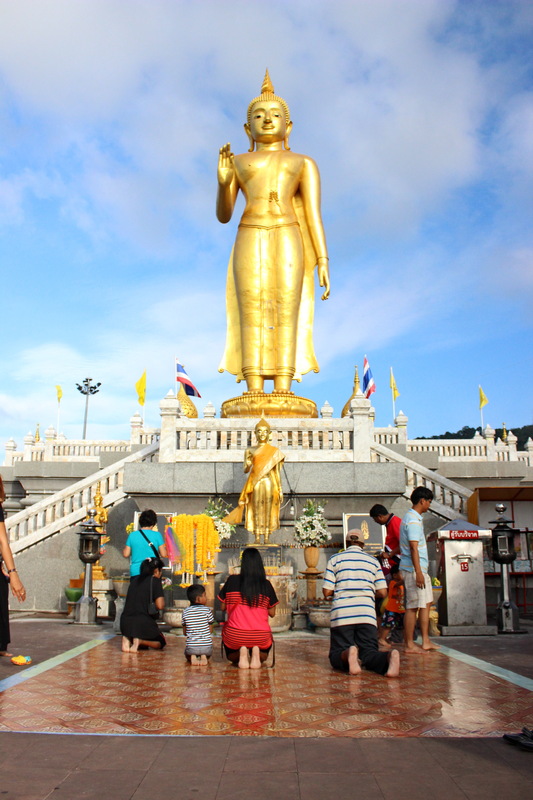 This place is a must-visit, equally for the 20m golden Buddha statue overlooking the city and the fantastic views across Hat Yai, especially at sunset. A bit busier than the other temples listed, but you will still be the only foreign tourists walking around. How to get there: You can take a white or dark green songthaew to the park entrance and then either walk up the steps (for the brave), take a tuk tuk or hitch a ride to the temple on the top of the hill. There is also a cable car service running between two of the temples and a free shuttle bus to take you to board the cable car (200THB adult/100THB child). This is the second temple found halfway down Korhong mountain. A 10m Buddha statue, this time in bright white jade stone. Walk through the dragon’s mouth and brave the steps that lead back up to Bodhisattva Kuan Im. This is the final of the three temples and sits behind the other two, joined to Bodhisattva Kuam Im by cable car. This Hindu-Buddhist temple is surrounded by trees and houses the three-headed elephant statue and is the source of the intermittent fire cracker explosions that can be heard throughout Korhong mountain. Find yourself a shady spot to sit and watch the locals praying. On the other side of the road and just before the turning for the municipal park is this quaint little temple that also happens to boast its own radio station that plays over loudspeakers around the temple grounds. There is a sizeable stupa and its worth a walk around it to look at the old paintings on the doors and wall panels. 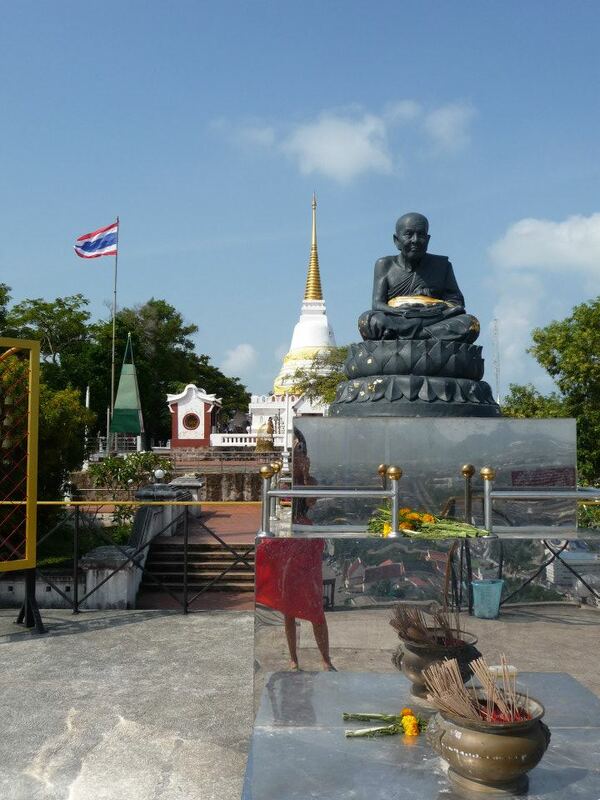 Look out for the coin operated water feature/shrine – strange to say the least! How to get there: Take the same songthaew as you would to get to the municipal park (see directions above) but look on the left hand side of the road and get off after the seven-eleven near the entrance to the park (the park is on the right). If you reach the park you’ve gone too far. If you find yourself with a little more time or the urge to go further afield, these two temples are within easy travelling distance of Hat Yai. Songkhla is the Hat Yai’s smaller neighbor and is home to the closest beaches and the largest lake in Thailand. To take in the views of Songkhla head to Tang Kuan hill where you can take the cable lift (20THB) up the side of the hill and walk around the grounds of Sala Vihan Daeng – the royal pavilion that houses Wat Tang Kuan. Many locals come here to pray alongside romantic couples coming to secure a ‘love lock’ to declare their undying appreciation of one another. Watch out for the monkeys that can be found around the foot of the hill. How to get there: Take a dark green songthaew to Songkhla centre and then a tuk tuk to the temple or follow the 407 in the direction of Songkhla – 30 to 40 minutes and you’re there. Located close to the Malaysian border town of Pedang Basar this temple is handily placed for anyone doing a border run. This is an amazing temple complex sitting above and throughout a series of caves with Buddha statues hiding among the stalagmites and stalactites. 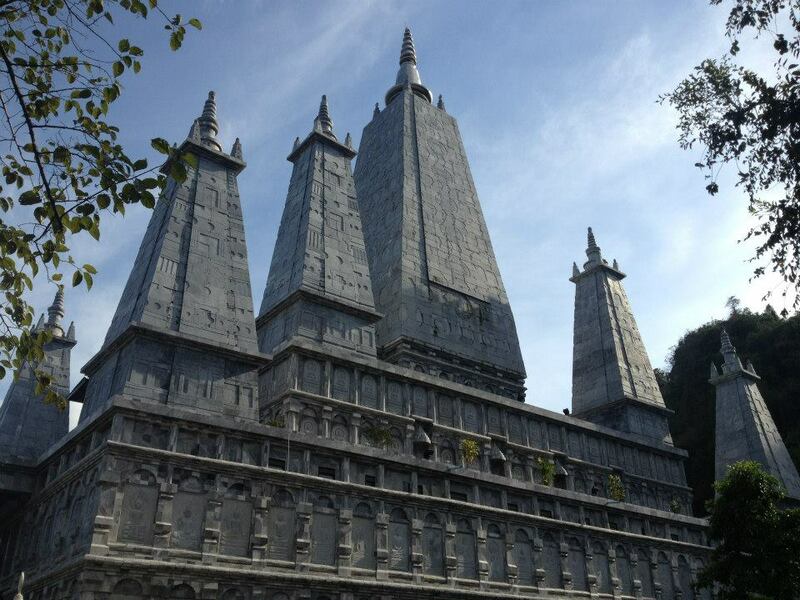 Walk around the grounds, play spot the Buddha and admire the unique architecture of this one of a kind temple. It doesn’t look like the average Thai temple, likely because of its proximity to the border. How to get there: Access to your own transport and a full day is a must – give yourself a couple of hours to comfortably make your way there, stopping off at a few local markets along the way. [i] Where own transport is recommended, try renting a bike for the day (around 200THB) or if you are in a group you can rent a tuk tuk with driver for the day (after some negotiations on price). [ii] Songthaews are pickup trucks that have been converted to include benches and a roof, offering an affordable and convenient method of getting around the city center. In Hat Yai the songthaews operate on a color basis but it is always best to ask the driver rather than rely on the color of his truck guaranteeing that you will get to where you want to go. Songthaews cost 10-15THB, paid as you jump off at your destination. 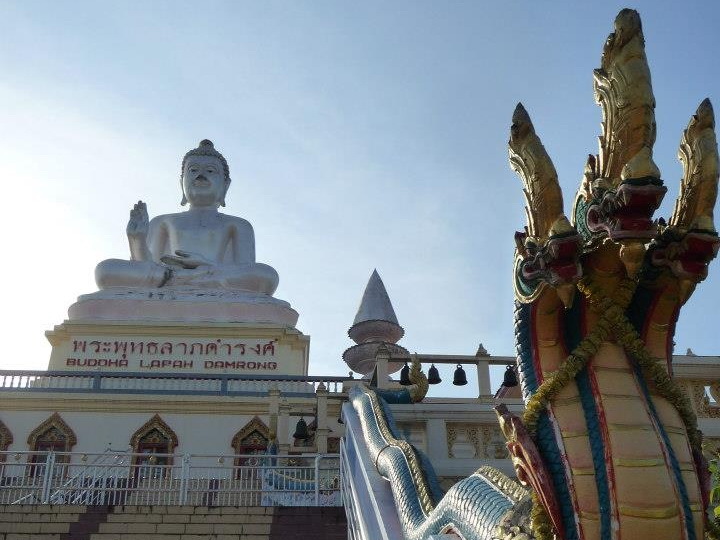 Posted on June 6, 2014 October 11, 2014 by cornishkyliePosted in Hat Yai, TravelTagged asia, buddha, buddhism, hat yai, HatYai, temples, Thailand, top ten, travel, travelling, wat. It’s quite surprising that a city like Hat Yai has such a number of amazing temples. It took some exploring to discover them though…! Very nice shots of these places.. Thanks, a couple were only with my iphone and I really want to go back with a proper camera. The great things is these places are so beautiful that it speaks for itself on camera. Kylie, this pictures are stunning and the information is great – off the beaten track – i like that!